The Hubby and I are totally in love with our juicer right now! Delicious fruit and veggies are everywhere in the markets, we are juicing everything. 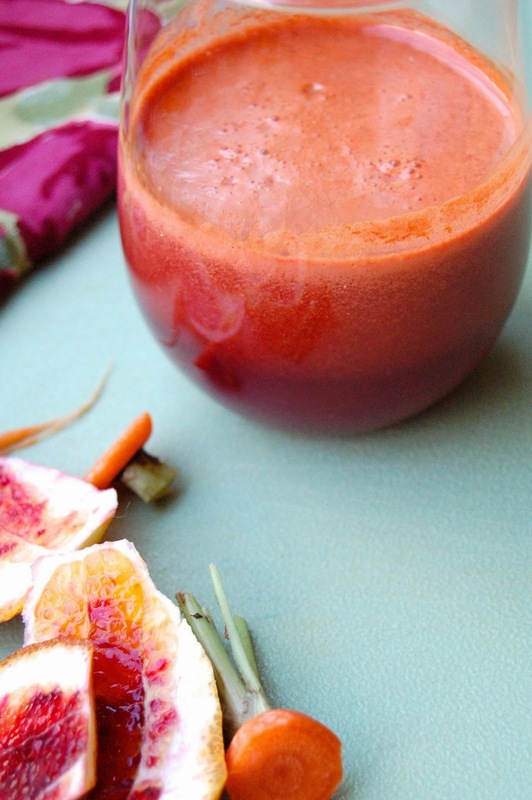 Our current favorite concoction is orange carrot, which we usually enjoy in the morning before coffee. Orange carrot juice is probably one of the best things to start your mornings. It is a refreshing, sweet combination that makes you feel like you are getting off to the right start. Not to mention the loads of vitamin C, and even more vitamin A, making this one hell of a dose of daily nutrition. I am into juicing right now for two reasons; I actually have time on the weekends to use and clean my juicer, AND it helps me sneak in the benefits of fruits and vegetables without upsetting my digestive system. When I experience flare ups, it is very hard for me to eat raw fruits and vegetables. To prevent malnutrition, I have found my tummy can tolerate juice of vegetables and fruits. My favorite combination is using Blood Oranges, but their season has pretty much come and gone (sad). So I just make due with the oranges that are available. If I am juicing for just myself, I always add in a little fresh ginger for an extra tummy-pleasing kick! Put all the ingredients through a juicer, stir juice and enjoy. This can be stored in an air tight container or mason jar in the refrigerator for up to a day. Another option is to blend the ingredients in a high-powered blender (such as a VitaMix) and strain the pulp through a fine mesh sieve or cheesecloth. This probably won't produce as much juice though.